Seven yesterday confirmed My Kitchen Rules would return on Monday January 30th. The date is one again a day after the Australian Open and two weeks before the start of official ratings. It’s also the same day as Nine launches Married at First Sight, but a day after TEN’s I’m a Celebrity Get Me Out of Here! Neither Nine nor Seven has confirmed a 7:30pm start, but unless someone attempts to be completely radical and get the jump on its rival, both will launch head to head. 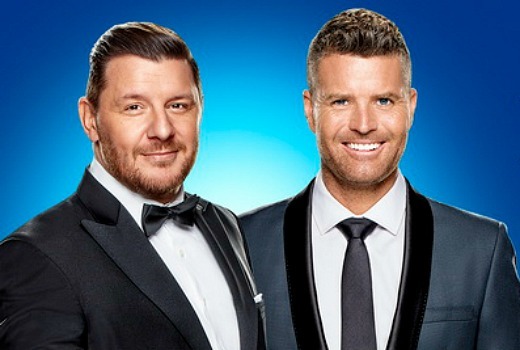 Seven’s Melbourne launch for MKR is set for the same night, with a Sydney event taking place the week before. Seven suggests three records will be broken in the first round of the hit series (it isn’t confirming how many rounds). Monday January 30 on Seven. Every man, woman, child whinge about the endless ‘After the Tennis’ campaign that begins during the Flemington Carnival. But yet again, the show continues to dominate the ratings. If viewers are really that sick of the tired format that is MKR, then they wouldn’t watch. Seven will continue to make the program the way they do because it is successful, so if you have had enough, don’t watch it. They will get the message. See i’m the opposite to others. I love the challenges they have to do. Especially when they are for an event. By the time the end of the series comes to ahead and they do the instant restaurant rounds again i’m a tad over it. But I will still watch it. “three records will be broken” – that’s just cruelty to vinyl. Ugh, don’t think I will watch this year’s as much. Just watching the promos tires me lol… Can just hear manu & pete now “melt in the mouth” “best dish I’ve everrr had on mkr” ? Hmm…confirmed a day after the airdate for I’m A Celeb. Wonder if they were waiting for TEN? I doubt it… I’m a Celebrity, TBL, MasterChef Professionals etc have all launched on the day of the Australian Open Men’s Final over the years, it’s probably the easiest slot to predict every year (along with the MKR launch). If everyone is bringing out their ‘big guns’ , then I don’t understand the relevance of ‘non-ratings’ period. Does that mean the advertisers don’t have to pay a premium for these shows during the non-ratings period? By the look of the promos this year are they employing actors or contestants? It has a Jerry Springer/Mystery Diners feel to it. Looks like the usual line-up of truly awful people. Watching the incessant previews of MKR it seems more about the contestants and less about the cooking. I haven’t watched the show in years, not since the move to make the personalities of the contestants more important than the food.